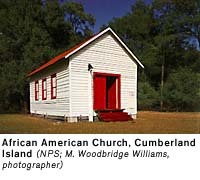 Cumberland Island National Seashore is north of the city of St. Marys. National Park Service visitor centers are located at the Sea Camp and Dungeness docks. A National Park Service passenger ferry provides access to the island from St. Marys, Georgia. For more information visit the National Park Service's website, Cumberland Island National Seashore, or call 912-882-4336, ext. 254.